This item can only be shipped via Standard Shipping within the 48 contiguous United States. For safety reasons, we cannot ship sparklers internationally or to HI and AK. Imagine it: Hearts on fire with happiness, the newlyweds step out into the crisp night...and are greeted with a rousing round of cheers and the bright, sparkling glow of heart shaped wedding sparklers! 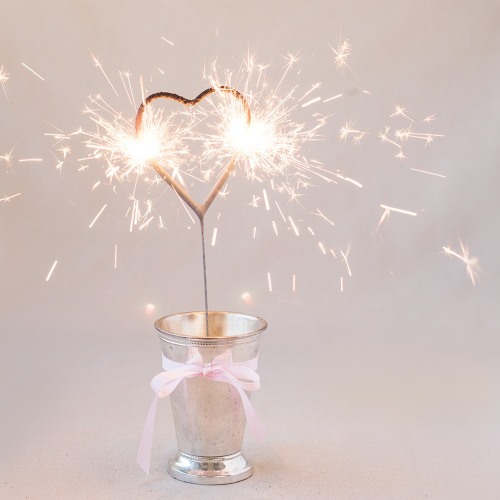 Make your wedding exit a memorable one by giving guests these heart-shaped fireworks. Simply light and enjoy! Burn time is approximately one minute each, so you may want to give each guest two sparklers to ensure your photographer can capture the moment. Available in sets of six. Each sparkler measures 11"L x 3.5"W.